I'm Here. I'm Queer. What the Hell do I read? 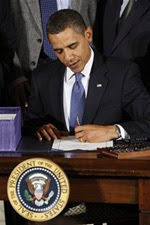 : President Obama ACTS! The Matthew Shepard and James Byrd Hate Crimes Prevention Act is LAW!!! President Obama ACTS! The Matthew Shepard and James Byrd Hate Crimes Prevention Act is LAW!!! So, with that, I'm going to sign this piece of legislation. Thank you all for doing a great job. All right. This is the first time ANY federal equality measure protecting LGBT rights has become law. The very first time. And it is the first federal law to explicitly protect transgender people. It is a touchstone in our movement, a triumph of what is right. And I truly feel things will never be the same. It took twelve years, over one million emails, faxes and phone calls to Congress, and 14 separate votes on the floors of the House and the Senate to turn the hate crimes bill into law. It took too many innocent people dying. And it took so many people standing up for what is right - even when it was hard, or there was a cost to it. We now have a Law that explicitly says that targeting Gay, Lesbian, Bisexual, or Transgender People is WRONG. A Law that proclaims that we, members of the Gay community, are legally protected. I do think that all crime is a form of hate crime. But having the Law of this land state unequivocally that GLBTQ people are to be protected is huge. A prominent characteristic of a violent crime motivated by bias is that it devastates not just the actual victim and the family and friends of the victim, but frequently savages the community sharing the traits that caused the victim to be selected. This Law changes the MYTH of what's okay in our society. It's no longer "okay" to gay-bash. The world is changing. We finally have some solid ACTION, some results, from electing President Obama. And we have Halloween weekend to celebrate. Equality for all. Liberty and justice for all. I can see the future. And it's getting better. Here's the full text of the new Law on the Library Of Congress website. Amen. And about damn time.